Hoteliers are now offering fast hotel Wi-Fi along with personalized services to improve their guests’ overall satisfaction. Nowadays, hotel guests have great expectations of hotel services. A warm welcome and a hospitable staff are not enough to provide a high-standard customer experience at the hotel. People are used to being connected anytime, anywhere, with multiple devices. 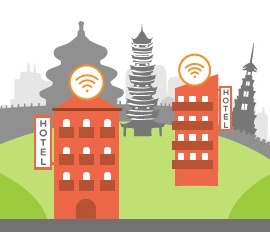 As a result, hotels without fast Wi-Fi are less likely to keep clients coming back. Hotel guests use the Wi-Fi in multiple ways: to check their emails, to connect to social media, to stream movies on Netflix, to download music or to watch videos on Youtube. Wi-Fi is also commonly used by children, who want to play online games or download the latest apps on their devices. Nevertheless, most of the time guests are not satisfied with the internet speed offered at the hotel. Guests often complain about the lack of IT-knowledge among hotel staff in case of poor connectivity and, for this reason, hotel owners are making sure to provide good quality Wi-Fi and appoint competent hotel staff ready to assist visitors with any technical challenges they may face during their stay. Hoteliers realize the great potential of tech-driven services and understand that personalisation is a valuable element to position their hotel as a top-level player in the hospitality industry. Some hotels have started providing advanced personalization services, like the ability to save each guest’s preferences for lighting, music and temperature. These smart personalized services enable the guest to switch on/off commands automatically, through wireless sensors,in some cases, hotels allow guests to use their smartphones as their room keys. These are just a few examples of the types of comfort that every hotel could provide to further personalizing guest services, and to stay up to date with the latest technologies. Guests perceive that no hotel is worth paying a considerable amount of money for, if it does not catch up with the advancements in technology, particularly, if it does not provide fast Wi-Fi. Thanks to fast hotel Wi-Fi, hoteliers are now able to improve user experience, by offering interactive and personalized services to their guests. For example, some hotels in Japan allow their visitors to check-in using their personal devices. As Wi-Fi is one of the core amenities when choosing a hotel, hotels have started investing on deploying Wi-Fi access points, increasing the available internet bandwidth, and personalizing their services in order to boost their revenue and overall improve guest satisfaction. Find out more about how the hospitality industry can leverage Wi-Fi to grow their revenues, get positive word of mouth, keep their guests happy and willing to return.